During the winter months when other leafy greens are out of season, kale is in full bloom, in season, and richest in flavor. This leafy green, cruciferous vegetable is versatile to cook with and can be prepared just like spinach or any other greens. As one of the most nutritionally dense foods, Kale scores a perfect 1,000 on the Aggregate Nutrient Density Index. The ANDI score is a food rating system that measures nutrients per calorie. One cup of kale has only 36 calories but it’s chock full of Vitamins K (1328% RDA), A (192%), C (90%), and E (6%). 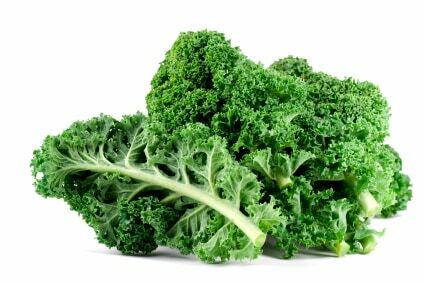 Kale also has calcium (9%), iron (6%), manganese, copper, calcium, fiber (10%), vitamin B6, potassium, iron, phytochemicals and even Omega 3 Fatty Acids (10%). Phytochemicals: Kale lowers the risk of cataract and macular degeneration because it’s an excellent source of phytochemicals (lutein and zeaxanthin). For optimal eye health, the daily suggested dose of lutein and zeaxanthin is 6 to 15 milligrams. One half cup of cooked kale meets the recommended daily dose of these 2 phytochemicals. Along with lutein and zeaxanthin, Kale also has 45 other flavonoids—powerful antioxidants—linked to the protection against cancer. Kale is not fussy. It doesn’t require much prep at all so it’s a really great food friend to have, especially if you’re a busy person on the go (and let’s face it, who isn’t!?). As with all veggies (and especially dark green leafy ones), make sure you wash each leaf in cold water thoroughly. While they are dripping dry, cut out the big stem in the middle. 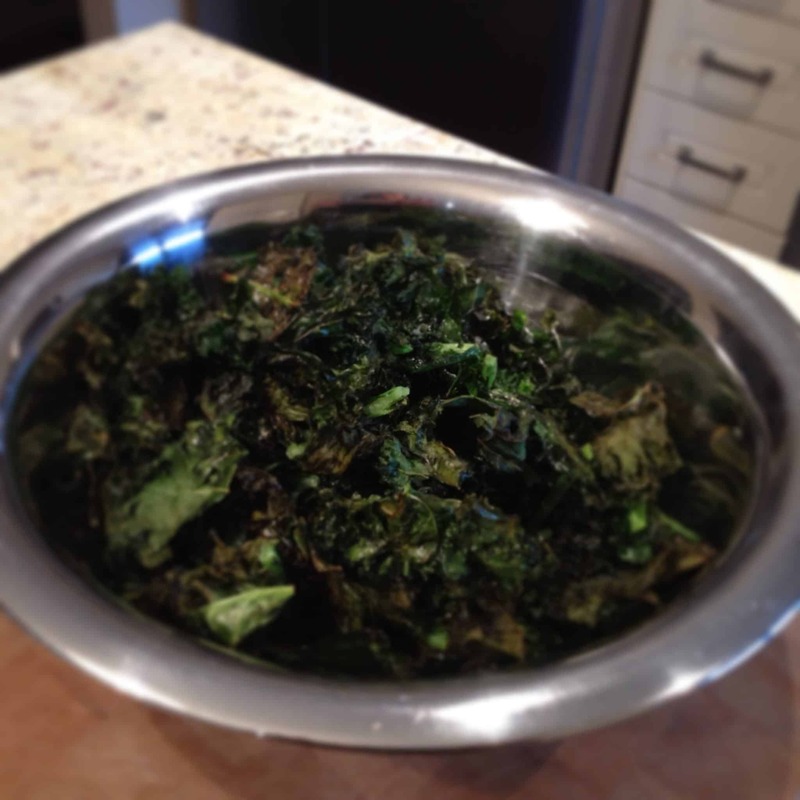 Kale Salad: chop kale finely (amount is up to you!) . I recommend this lemon/tahini dressing: olive oil, a spoonful of tahini paste and fresh lemon juice; pour over the finely chopped green leaves and let sit for 15 to 20 minutes. The dressing will ‘marinade’ the leaves, softening them and soaking up the sunny goodness. Top with whatever veggies you like! Some of my favorites are yellow peppers, shaved fennel, avocado, pomegranate seeds and sliced cucumbers! Sautéing/Braising: sauté it with garlic and coconut oil (great as a side dish or as part of a main dish!). Use 2-3 cloves of garlic and about 1 tbsp coconut oil to one big bunch of kale. Gently heat the garlic then add the washed and chopped kale to your frying pan. You want to cook it over a medium-low heat until the leaves soften and wilt. How long you sauté is a personal preference, but I like my kale to keep some of its bright vibrant green color and health benefits so I don’t cook it for more than five minutes (remember, even if you turn off the heat, food keeps cooking!). If you want to go without oil, try braising: simmer in three-quarters of a cup of veggie broth for 20 minutes to soften up the leaves , drain and serve. Steaming: Cover with a little water and cook until soft. Super healthy. Also: I add chopped kale to soups, stews, grains (like millet and quinoa), mashed potatoes and pasta (about a cup but the amount is up to you!). I also like to toss some kale into my smoothies. Avoid washing kale until just before use, since it will hasten spoilage. Kale will shrink during cooking, like spinach does but not as drastically. As with any fruit or vegetable, it’s best to buy kale in season. Fresh kale should have a bright green color. Avoid kale with yellow or brown leaves—that means it’s getting old. Green kale – the most common variety in the grocery store, has a firm texture and curly leaves. Red kale – similar in taste and texture to green kale, but adds a splash of red or purple to your plate. Dinosaur kale (also called Tuscan or Lacinato) – the leaves are flatter and more tender than the other types. Ornamental kale – tougher than other kinds, and available in green, purple, pink and white. Often sold as decoration for a garden or window box, it’s still edible and makes a great garnish. Have fun with kale. Eating more of this good green stuff will make you feel better, more vibrant and have increased energy. Now you have no reason, not to eat your greens! What a super food! I am glad that I started eating it this past week. Your recipe for the salad and the kale chips sound really good! I have tried to eat Kale before, but I hate it… =( At least I’m trying. I just want to like the food I make.